Here's one of many "pinup"-type drawings I did years ago, this one from 1985. It's interesting to look at these early pinups, when I was still drawing the Turtles as they appeared in the first few issues of the comic book. It's funny to look at the computer Don's using -- obviously state-of-the-art at the time, but looking pretty dated now, with its bulky CRT monitor and dual five inch floppy disk drives. 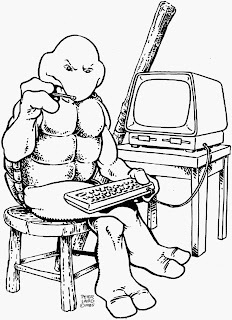 Also, this drawing somewhat obliquely references something that I had given some thought to but never really did anything about, preferring to just let it slide... and that is the fact that, given the size and shape of the Turtles' fingers, it would be very difficult for any of them to type on a standard computer keyboard! I remember that this is why I drew this one with Don holding that pencil -- I was thinking that he could use that to press the keys with so his big green fingers wouldn't mess things up. I even, at one point, did a few little sketches for "typing caps" -- little plastic doodads which could be slipped over a Turtle's fingertips. These caps would have small, normal finger-sized projections which would allow for more easy typing. "that the Turtles, realistically, would not ALWAYS wear their gear." Yeah, i have noticed that sometimes they wear their gears when they really don´t need them. I really like the the Turtles depicted "out of uniform" when they're off duty, and just kickin' it at home. It always feels real. Besides, it makes it more fun to know who is who based only on what they say, how they act, and how well I think I "know" them. -->> ..what kind of machine is he running there ?? not an Applie II e ?? Yeah I wish they were shown "off duty" more often, why would they be relaxing with all their gear on? I like to see them without masks, and gear sometimes. At least in the current toon they HAVE been seen without masks and occasionally sans gear. I love the off duty pictures. I agree, it was kind of silly to see them in gear all the time....this is a really wonderful picture. I always wondered about the keyboard thing. But you know you have a good story going when your readers engage in a full willing suspension of disbelief. Although I always figured for home use Donnie would just go the extra mile and make a keyboard for himself with larger buttons. I gotta say I like this depiction. Good to see some off-duty time. Definitely one of my favorite pieces. Hi Peter, I am huge tmnt fan. wasn't sure how to email you so i figured i could post a comment here. Went to the City (New York) for Halloween and went as a ninja turtle. You would not believe the overwhelming response to New Yorkers, i had NYPD, NYFD, and tons of people saying how cool the turtles were and how they wanted pictures of me. Just wanted to say thanks for creating them. My girlfriend went as April so we put up our pics at decobot.blogspot.com if you want to see. It always makes me happy when other people stop me to tell me how much they loved the turtles so Thanks, and thanks for your time! -Mauro"